Guns And Dementia: A Growing Worry For Families As Americans Age : Shots - Health News It's estimated that nearly half of all Americans over 65 own a gun or live with someone who does. And 7 million in the U.S. have dementia, a number that's expected to double within two decades. Helping a spouse or parent who has dementia steer clear of hazards can include ridding the home of all guns. That's a growing problem, as the U.S. population gets older and the number of people with dementia soars. 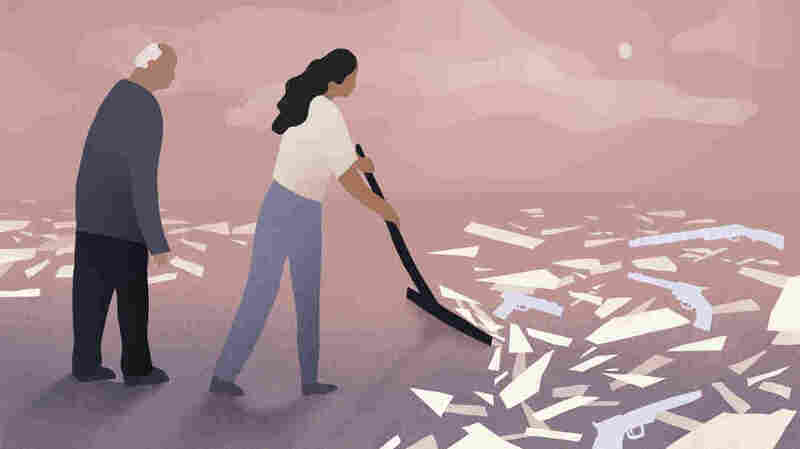 According to the Alzheimer's Association, that number is expected to double in the next 20 years to about 14 million — the vast majority over the age of 65. At age 87, Ed can still sing the songs from his favorite musical, "Oklahoma," by heart. He'll gladly launch into "Boomer Sooner," the fight song from his alma mater, the University of Oklahoma. But as one of the millions of Americans living with Alzheimer's disease, he also has significant memory loss and is prone to delusions. 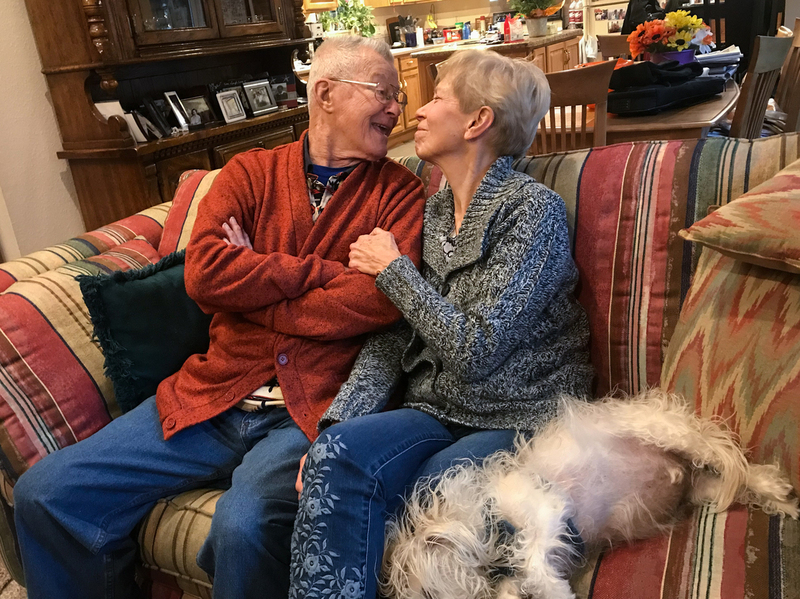 Ed, Kathy and their dog Charlie at home in Aurora, Colo.
"He was afraid of me"
Late one night about a year ago, there came a turning point. For the first time, Ed didn't recognize his wife, and he grew agitated. "I realized that he was quite afraid," Kathy says, "and that he was afraid of me. He didn't recognize me as a loving, caring person." Ed was so afraid, that he walked into their bedroom, locked the door, and said something ominous. "He [said], 'I have a gun,' " Kathy recalls. "And the truth was, there was a gun in that room." Kathy knew the gun was loaded. "I broke out in a sweat," she recalls. She spent an anxious night in the hallway outside that room, afraid things would escalate if she called the police. By morning, Ed had calmed down, and he unlocked the door. To Kathy's relief, she discovered that he hadn't found the gun. But the incident was so frightening that she immediately took the weapon to the basement, removed the ammunition, and locked it away. In hindsight, Kathy wishes she had been more vigilant and anticipated this turn of events. "I was angry with myself for putting my husband and myself in jeopardy," she says. But those who work with dementia patients say family members often don't want to think the worst. 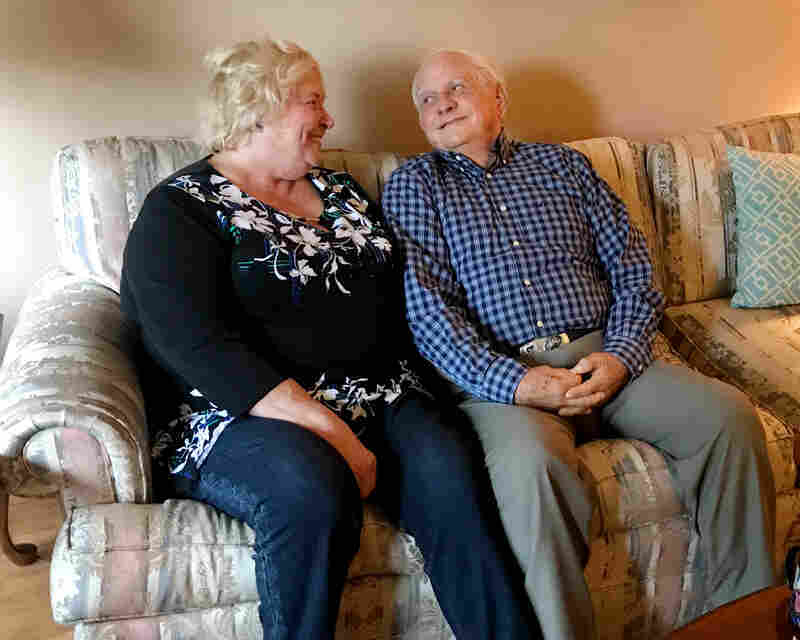 "Most caregivers tell us, 'I've been married to him for 50 years; he would never hurt anyone,' " says Joleen Sussman, a psychologist who specializes in dementia at the Veterans Affairs Medical Center in Denver. "And then it's talking to caregivers about, 'Yes, he would not, but his disease might hurt someone. So we have to talk about this.' "
"Do you have guns? How many, and where are they?" Sussman wants this safety issue to be top of mind: "If I had anything to say to health care professionals across the country, it would be, please, along with driving, please ask about firearms, too," she says. Sussman advises those in health care to ask patients not just, "Do you have guns?" but also, "How many? And where are they?" "Once I ask about firearms," Sussman explains, "I'll say, 'So, do you keep those at your bed stand within arm's reach while you're sleeping at night?' Many veterans will say yes. 'Is it loaded?' Yes. 'Does your wife sleep with you?' Yes." Psychologist Joleen Sussman specializes in dementia at the Veterans Affairs Medical Center in Denver. She says using the word "retire" with people in the early stages of dementia can be "pretty palatable for both driving and firearms." If you couple that proximity with the confusion, paranoia, and anger that can accompany dementia, you get a potentially deadly mix. Sussman has found that using certain words can make the conversation about guns easier. For example, she says, the word "retire" can be "pretty palatable for both driving and firearms." For patients in the early stages of dementia, Sussman says she might tell them, " 'You're going to need to retire from driving and retire from the use of firearms.' Which changes it from, 'We need to take these away' or 'You need to stop.' So let's plan." For many gun owners, their firearms are so deeply entwined with their identity that asking them to give up their guns can be really difficult. "[Guns] represent something about independence and autonomy to them, that's their right to have," says Beth Kallmyer, vice president of care and support with the Alzheimer's Association. "They might say to you, 'I don't care. You're not taking my guns,' Kallmyer says. "But they might say to you, 'You're right. I want you to step in when I can't make that decision for myself anymore.' And then that helps the family later on." Kallmyer advises families not to wait, and to have these conversations early. 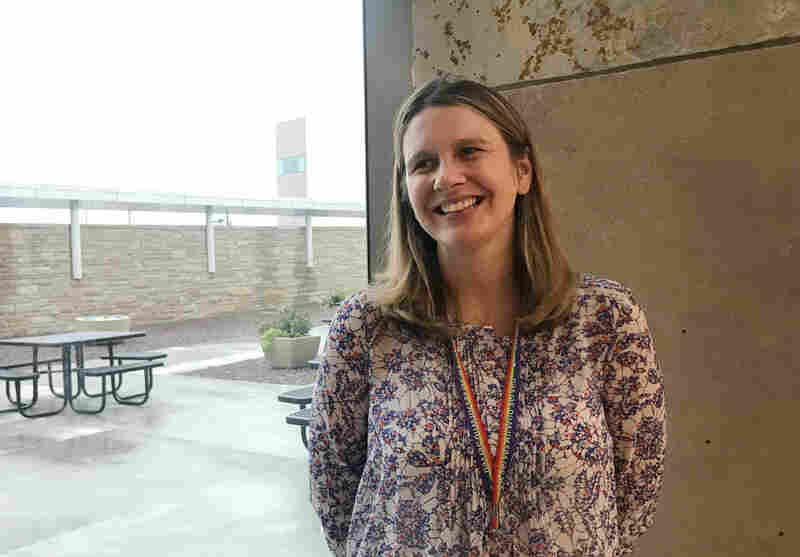 Dr. Emmy Betz, who studies guns and dementia at the University of Colorado School of Medicine in Denver, suggests that families draw up a firearms agreement — a kind of advance directive for guns. The conversation, Betz says, might include questions like "Who do you want to be the one to say, 'I think it's time'? Who do you want to give [your guns] to? Is it your family member? Is it Joe down at the gun club? So that you're still the one making the decision. Even if when the time comes, you're not aware of what's happening." Even after Lloyd Bates, 87, of Denver was diagnosed with dementia, he and his wife, Carol, still slept with his Colt .45 revolver next to the bed. "Lloyd's always been very conservative and passive and careful," Carol says, "and never prone to anger. It just never dawned on me that it would be a problem." But as his disease progressed, they locked it up. "I understood very well the dangers of having a gun in the house and what it could lead to," says Lloyd, who served as a gunner with the Navy in the Korean War, and is a former deputy sheriff. Carol and Lloyd Bates in Denver, Colo. "I understood very well the dangers of having a gun in the house and what it could lead to," says Lloyd. So, after his dementia diagnosis, they locked away his Colt .45-caliber revolver. Carol adds, "We can't trust his brain right now to drive, so why would we trust his brain with a gun?" Carol says the conversation about firearms wasn't nearly so easy with another family member: a brother-in-law with dementia, who was deeply attached to his gun collection. "Those guns were like a part of his persona," Carol says, "and he would throw temper tantrums. He would say, 'Nobody's gonna take my guns.' Finally, he ended up with no guns, but by that time, his dementia was so bad, he didn't know he didn't have 'em." As for Lloyd and Carol, his handgun and hunting rifles are now locked up in a gun safe — out of sight, out of mind. And they're fine with that. "I haven't seen my guns for years," Lloyd says. "That's because he wrote down the combination, and he lost the combination, and I don't know the combination," Carol says with a grin, "so they're safe!" "They're safe in the safe!" Lloyd adds, chuckling. "That's a real simple solution," Carol says, "to a complicated problem."